After a relatively easy crossing, we woke the next day at a site called First Look. The action kicked up immediately when a huge great hammerhead shark showed up only moments after dropping the first bait crate in the water. The huge dorsal fin slicing the surface was unmistakable…this one was a monster! A few lucky souls caught a glimpse of the hammerhead underwater passing in the distance. The reef below the boat was swarming with Caribbean reef sharks. Every so often a lone lemon sharked popped up to checks things out. This was the perfect opportunity for some of the new shark divers to cut there teeth and hone their camera skills before the big boys showed up. 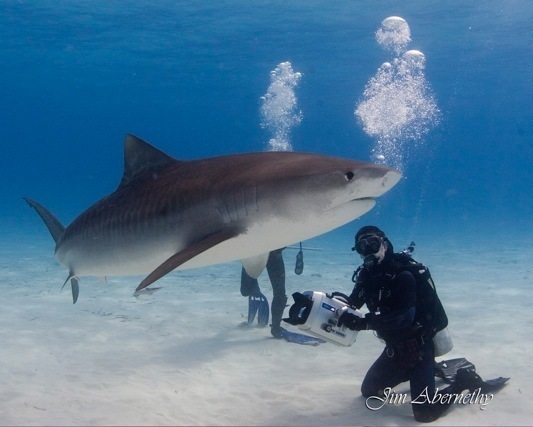 As a crescendo to the first day of diving, a beautiful 10 foot tiger paid a visit. While ascending to the down line, the tiger made one pass after another, offering incredible photo opportunities in the deep blue water. What a way to kick start a trip! Day 2 put us at the famed Tiger Beach where sky blue waters lapped on the golden sands of the serene Bahamian islet. One would never suspect what awesome creatures swam below the surface in these waters. We started the day with Lemon Snaps. Forget images of English tea time because these little biscuits have teeth! The trick is to “snap” split shot of a lemon shark, mouth wide open, silhouetted against the rising sun. Sound easy…ask anyone who’s tried it. By the time we had finished our Lemon Snaps, the water was teaming with lemons and tigers. The crew jumped in and the show began. We had a dozen lemons and four magnificent tigers ranging in size from 6 foot Kimberly and Begonia, to 10 foot Baby Cakes, to queen of the prom Emma measuring in at a massive 14 feet. The visibility was spectacular, the lemons playful, and the tigers well behaved ‘players’. A perfect day on Tiger Beach, what more could you ask for? As the tides shifted and visibility degraded, we decided to leave the beach and go looking for dolphins up north. Luck wasn’t on our side and we reluctantly turned back. But the day was not over. We stopped for dinner at the Sugar Wreck. After a quick meal, we pulled on wet scuba gear for a night dive. Huge loggerhead turtles, giant barracudas, puffers, squids and various other night creatures were among the treats that night. Unfortunately the winds picked up and we had to head south for cover. The next day in churning seas, we searched for a dive site that would afford some protection. Ultimately we landed on Carcarius Cut. With storm clouds overhead and tumultuous seas, the visibility was dropping quickly. We braved 2 dives and enjoyed encounters with numerous Caribbean reef sharks, a huge school of barracuda, large groupers, a glass minnow swim through, lion fish and for those lucky enough to spot them, 2 tiger sharks. The weather continued to degrade as we quickly pulled anchor. This time we ran even further south and hid behind Grand Bahama. The following morning and day 4 we returned to Tiger Beach. The storm had done a number on the visibility. A few of us did a little lemon wrangling to pass time, hoping the shift in tides would clear the water. After several hours, a few eager souls jumped into the murk. We quickly deemed it not such a good idea and abandoned Tiger Beach for the day. On our way to next dive site, good fortune smiled on us and delivered some spotted dolphins leaping in front of our bow. We all grabbed snorkels and fins and on Jim’s command, leapt into the water. Within seconds 3 dolphins whirled through the group. One pass after another, twisting, turning and spinning, all in deep blue water. Everyone had amazing encounters. We were all grins. Eventually the playful dolphins tired of us and we continued on our way. We arrived at the dive site of Sherwood Forest. The sun was moments from setting so lights were mandatory. The visibility was nothing to write home about and the water was getting cold. A few Caribbean reef sharks showed up but they too seemed to avoid the cold thermocline…who says sharks aren’t smart;) A few in group put on their “Lembeh” hats and busied themselves with macro critters. We were all stunned by the images of what they uncovered just meters from the anchor. With seas settling down, the decision was made to journey to “The End of the Map” in search of the great hammerheads. This is the site where it all comes together. True to form, we had exciting and close encounters with Tigers, Bulls, Great Hammers and even a couple of Nurse Sharks. The current was mild and visibility good. Most of the action happened on the bottom at 85 feet, with an occasional sniff by a Tiger on the surface. As the day passed, the wind and waves increased. By nightfall we were running north for shelter. Sadly, the next 2 days were blown out by wind ranging from 20-30 miles per hour. We busied ourselves editing photos, watching movies and wrangling a few sharks in the shallows. On the evening of our departure, we brought a few lemons in and did our best to capture Lemon Snaps in the setting sun. A final farewell to our shark friends and we headed west to West Palm. Throughout the week we had periodic reminders of how fragile these great sharks actually are. A hook lodged in the mouth of a tiger shark, a trailing fishing line from a bull shark, and the damaged jaw of a reef shark all pointed to it. Sharks are slow to grow, slow to reproduce and are incredibly vulnerable to over-fishing. Each day they are fished from these waters, and to a much greater degree, from waters around the world. Sadly, even though there numbers are already diminished by greater than 90%, no protection has been afforded them. We wonder when people will finally take notice, finally take action, finally do the right thing. On every trip Jim tries to increase the awareness of a few more people of the plight of sharks. Perhaps if he reaches enough people with this message, it will finally make the difference. Ever since I had seen the stunning images of the great hammerhead in close proximity with divers in an issue of the UK magazine “Dive”, I knew I would have to take this trip. Jim Abernethy runs what is perhaps the most unique and “real” shark diving expedition in the world. Nowhere else in the world do you spend the majority of your day underwater with some of the oceans largest predators with no cage, no chain mail, in fact nothing but a skinning pvc rod between you and these huge sharks, all in the incredibly blue waters of the Bahamas. On several occasions, we had great hammerheads, tiger sharks and bull sharks jostling for position to get a chance at the bait. Jim’s promises nothing on his trips as nature ultimately decides what will be served up on a given day. That being said, Jim delivers like no other. I can only count one dive where we were not in the water with large predatory sharks. 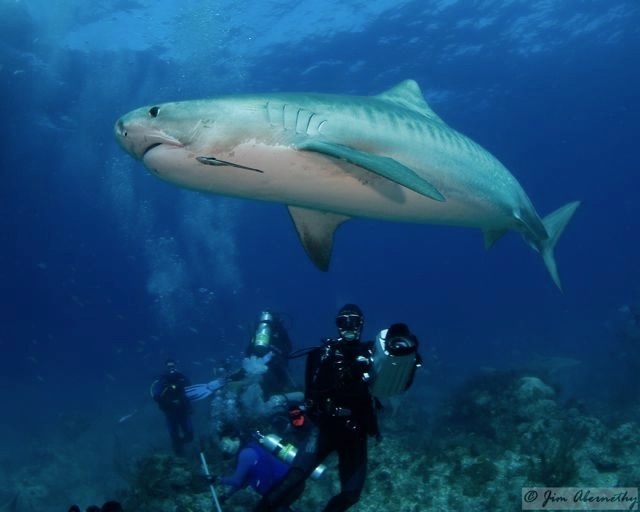 Tigers were the most frequent, followed by lemons, great hammerheads and bull sharks. Caribbean reef sharks were present on many dives but we considered these little sharks as merely pests getting in the way of the big boys. Most other places in the world are delighted by a reef shark. Over the course of the trip, our comfort level in the water certainly increased as our emotions transformed from fear to respect for these great creatures. 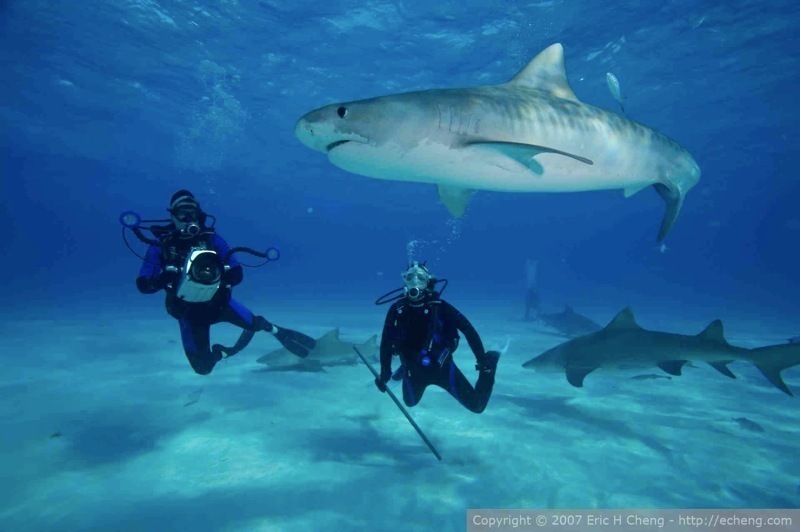 That being said, not once underwater did I underestimate these predators…especially the tiger sharks. Second to the great white, these sharks are the largest and most powerful sharks in the ocean. In an instant, they could turn me into a meal. It is astounding that the decide otherwise. It was this fact that left the greatest impression on me. We fear these great tigers and the world celebrates the fishermen who capture and kill them. We have virtually wiped them out of existence in most of our oceans. Yet when I entered their realm, completely unprotected and exposed, they investigated me with curiosity but did me no harm. These are creatures to be appreciated and predators to respected…these are Jim’s tigers.